Alex Braith is a woman with a difficult past, on her way to the distant moon of Titan aboard the tanker/transport ship known as the Southern Cross. * Her sister Amber died while in the employ of the mining operation of the Zemi Corporation, and Alex is looking for answers. 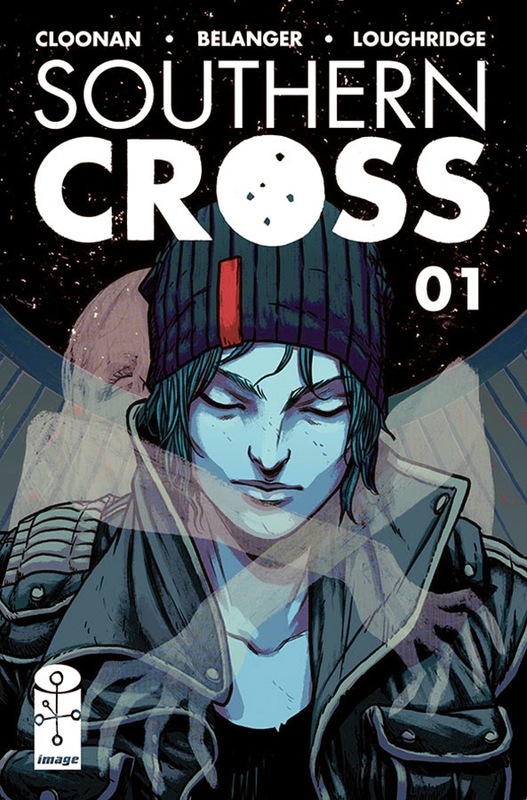 That seemingly straightforward premise is the basis for Southern Cross, a promising new science fiction series from Image. You might have noticed that there are a lot of new science fiction comics available (Image, among others, is heavily focused on science fiction these days), which is great as a science fiction fan. ** That being said, any story hoping to distinguish itself needs to bring something interesting to the table, whether that's an unusual premise, particularly distinctive art, or something unusual in the storytelling. 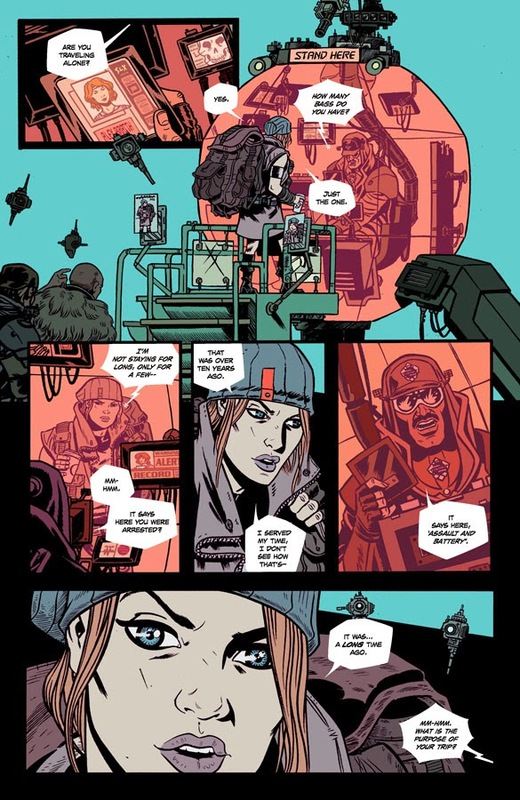 After only one issue, Southern Cross has a lot of things going for it; a great sense of design and style, a compelling narrator and protagonist, and an intriguing mystery. You've probably read or seen many science fiction stories that take place aboard starships, and they run the gamut from looking like a Hilton (Star Trek: The Next Generation) to looking like a factory or an old submarine (Aliens, Battlestar Galactica (the new one)). The Southern Cross itself, and the larger world of the story lean a lot more towards factory than Hilton, but the world doesn't just seem grimy, dirty and industrial. I think the creative team here understands that while that may be a more realistic approach to design, it's not a more interesting one. Artist Andy Belanger brings a tremendous amount of skill to this first issue, and he's asked to accomplish a lot in this first issue (at which he's pretty successful). So the ship has a lot of character, and variety of locations. The story begins in a futuristic spaceport, and moves through the space above Earth into the confines of the Southern Cross (and all over that ship). Sure, the sleeping quarters are spare and a little grim, but the engine room is bright and powerful, and the mess hall is open and bustling. This first issue also serves as a useful tour of the ship; the fact that Alex gets lost at one point and runs into the Captain (who takes her to the engine room and the mess hall) affords us a look at other parts of the ship we might not otherwise see. There's also a nice walking-and-talking scene on one page where the movement of the characters through the ship flows from panel to panel; Belanger has a nice handle on layouts generally, and keeps things moving. It's clear that the creative team has put a lot of effort into the design and look and feel of the Southern Cross; it's got a lot of personality and great, intricate detail. I imagine that writer Becky Cloonan had a strong hand in the look and feel of the series (as she is, of course, also an accomplished artist). Belanger's character design are compelling here (and in a similar--but distinct--style to Cloonan's own work, and that of Ming Doyle). They all have slightly exaggerated facial expressions, which work here as a lot of the story relies on watching people (mostly Alex) react to circumstances. What really elevates this issue above the standard science fiction "grim industrial starship" cliches (in addition to the thoughtful design mentioned above) are the stunningly good, non-obvious color choices from Lee Loughridge. If you're reading Deadly Class then you know the amount of skill and care that Loughridge brings to comic coloring (and if you aren't, stop whatever you're doing and go catch up on Deadly Class). Loughridge understands that even in a somewhat grim story and industrial view of the future, we're still talking about a trip off of Earth and into outer space. So, as you see the station and the ship and Earth, the colors pop off the page. Certain colors dominate certain pages in an almost monochromatic style, but other pages combine different color palates in an effect that's slightly jarring but brings additional visual excitement to the issue. In a story that's mostly "let's watch our protagonist take a tour of the ship and interact with its crew while meditating on the loss of her sister," those splashes of color are nice to have. I also thought the lettering choices from Serge LaPointe here were fun and effective; the intercom lettering worked nicely as a contrast to the dialogue and narration, and I thought that the more angular nature of the word balloons was a fun touch. 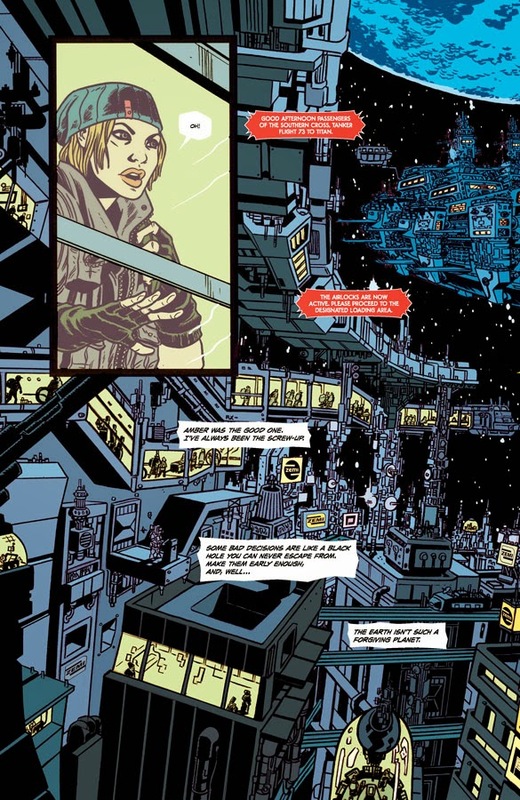 One of the things that's striking (and effective) about Southern Cross is the way that the look and feel of the series complements the story being told. The story mostly exists in this hard, cold environment and this fits well with Alex Braith. In Alex, Cloonan has created a compelling (if occasionally overwritten) character that doesn't need you to like her, but she expects you to take her seriously. From the very first page of the story, we learn that Alex has done time for assault. She clearly has very little time or patience for anyone aboard the ship, as she yells at someone (who happens to be the Captain) for bumping into her, and she plans to actively avoid spending any time with her bunk-mate (Belanger delightfully captures her annoyance in a number of places). There are a few times that the story could make do with a little less narration and just let the art tell the story, but for the most part the narration feels useful in the first issue both for exposition, and for establishing Alex's unlikable, somewhat obsessive, fairly hostile personality. She's clearly dealing with some aggression issues, and she sees herself as a screw-up compared with her dead sister; she's dealing with a lot, and while she's hard and a little unlikeable, she's not unsympathetic, and she feels meaty as a character which is hard to do after only an issue. She's also stuck on a ship for 6 days with not much to do but think about the loss of her sister, so the series should feel tense and a little pressurized, which the creative team does pretty well here. We've barely scratched the surface of the story but already seen a compelling protagonist and a richly developed environment. Southern Cross is a potentially grim place, but one worth visiting. * Not clear if you're supposed to hum the eponymous Crosby, Stills & Nash song. ** In fact, Image has been publishing a story (Roche Limit) that has some surface similarities (girl goes missing on distant moon/world, her sister goes to investigate).